Elegant protection for your vehicle. 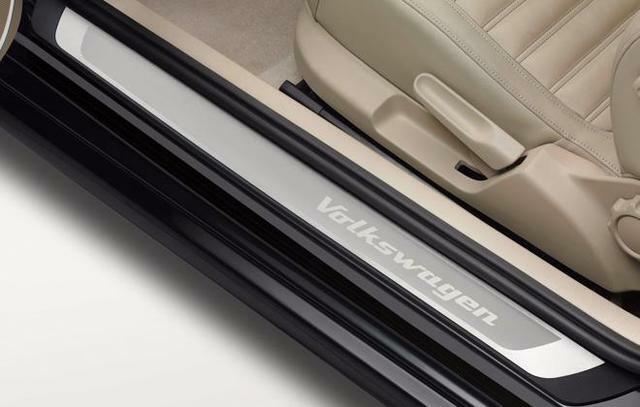 The high-quality brushed-aluminum insert features laser-engraved Volkswagen lettering. This stick-on trim not only helps protect your door sill rails with style but also customizes the appearance of your vehicle. Includes set of 2. Available in multiple Beetle nicknames. Not applicable for DUNE model. Elegant protection for your vehicle. This stick-on trim not only helps protect your door sill rails with style- but also customizes the appearance of your vehicle. Includes set of two. Available in multiple Beetle nicknames. Notes: Stainless Steel, Volkswagen Lettering.